San Francisco (Obama.net)- The past decade has been no stranger to natural disasters throughout the world. From Hurricane Katrina in New Orleans, Louisiana in 2005, to the tsunami in the Indian Ocean in 2004 that killed nearly a quarter of a million people in Indonesia, to the earthquake in Haiti that destroyed the entire state and saw another quarter of a million people lose their lives. Now, we can add the flood in Pakistan to the list of horrific events of the new millennium. 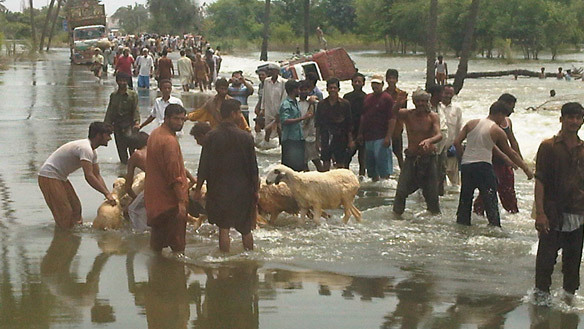 After days of suffering from the flooding, a total of over four million people are now homeless in Pakistan according to a United Nations report Thursday morning. The new statistics are more than two times that were previously projected. According to Senator John Kerry, the United States Secretary of State, Hilary Clinton, will make an announcement that the Obama Administration will increase financial aid to the Middle Eastern state by $150 million. The aid is desperately needed as twenty percent of the nation is now under water and many people are still struggling to get to solid land. This leaves many susceptible to being inflicted with illnesses and diseases that manifest in dirty water. The United Nations is also set to send 4 million more sets of tents and other materials for the people of Pakistan. Originally, the United Nations were only going to send two million sets. The United Nations has said that it needs $460 million for the aid it requires, but it has only accumulated half as the needed amount keeps growing. With over 1,500 people already dead from the flood, Obama is now shifting to helping the Middle Eastern state recover. The risk of more deaths is high as an estimated three and a half million children alone are currently at a risk for numerous water born illnesses. With the Haiti tragedy occurring not too long ago and the United States still working hard to help Haiti recover, the people of Pakistan can still be rest assured that President Barack Obama will in fact be there for them in their time of need.